Perfect for your sale or grand opening! 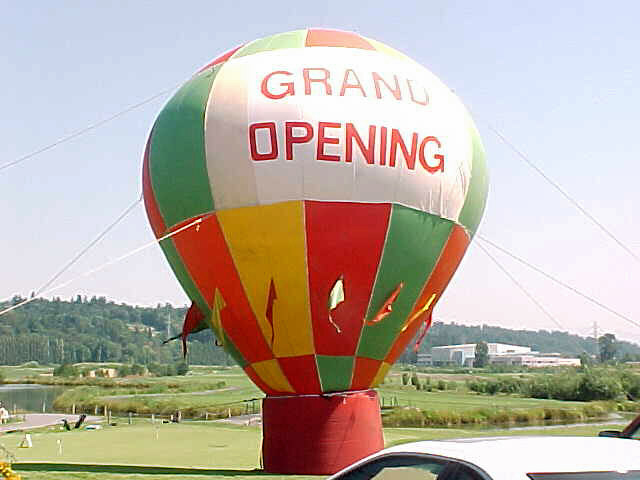 If you have a sale or grand opening at your place of business, our 25 foot tall rooftop display advertising balloon is a fantastic way to attract attention! Rates are on a sliding scale depending on how many days the balloon is on display. If you really need to advertise in a big way, this is the way to do it. Please call for details. We can bring one of our standard balloons to your company party, civic festival, wedding, or any other function where there’s a crowd who wants to experience a tethered balloon ride. The nine story tall balloon is tied to the earth and rises approximately 30 to 50 feet into the air, taking six passengers at a time for three to five minutes per ride. This will make your event truly stand out in everyone’s memory! The rate is $850.00 per hour, with a two hour minimum. We’ll be happy to send you a contract with complete information.